People come from all over the Los Angeles Metropolitan Area to dine in New Taipei (Rosemead). Lucky You! As a student @RULA you’re already in the heart of New Taipei! At the nexus of Chinese & Vietnamese cuisine, and with some Latin, Korean & Japanese, you’re in for a real dining treat here at RULA. And that’s not even to mention all the great International Delights you and your classmates might choose to prepare here in the RULA Cafeteria! More to come, but that’s a start! 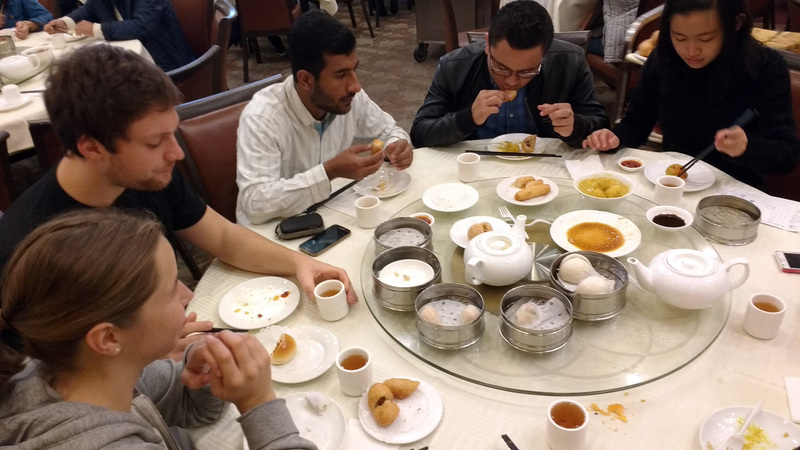 Linda (Germany) Joe (Germany) Sagar (Pakistan) Jimmy (Honduras) & Yin Chien (Malaysia) enjoying our bounty of Dim Sum. Since Yin Chien spoke Cantonese we were able to eat there and still follow Sagar & Mehdi’s dietary restrictions. Yin Chien deftly kept the meat and seafood items off the lazy susan, so everything on it was ok for everyone to eat. You can read about several great New Taipei Dim Sum breakfast spots on the Dim Sum post, but you don’t really need to look further than East Gourmet Seafood! It’s a short walk from RULA and the group can order everything we can think of and the total, with tip, will come out to about US$12 / person. Unless a member of the RULA group happens to speak Cantonese, you don’t really know quite what you’re eating, but for me that’s a lot of the fun of it. No menus! They walk around the large restaurant with carts filled with different Dim Sum dumplings and you just point at anything that looks interesting. Dim Sim isn’t the best choice for Vegetarians, Muslims, or Jews, since many of the items contain pork or seafood. I haven’t been to Hot Pot City yet! When Candi & Darich were here Candi was so excited about HPC, but we didn’t have the chance to eat there. All I know is they have a big patio and each table has a big “Hot Pot” in the center. The circular hot pot is divided with a yin yang symbol. I’m not sure if the 2 havles are oil and water? Or 2 different soup bases? I just know you order stuff and then throw it in your hot pot! More details after I finally eat there. 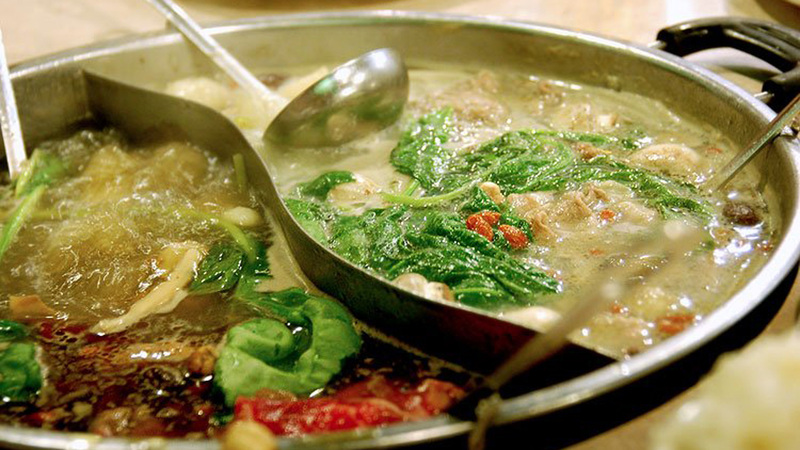 There are plenty of other hot pot places around, but some of them have more diminutive hot pots. At Hot Pot City it all looks kind of grungy-uber! A while back a new place called Crabulous opened down Garvey Ave. Maybe a year later Crabulous was re-christened All-in-Crab. Maybe another year after that All-in-Crab doubled the size of their space and went fusion and became Pho Boga / All-in-Crab. 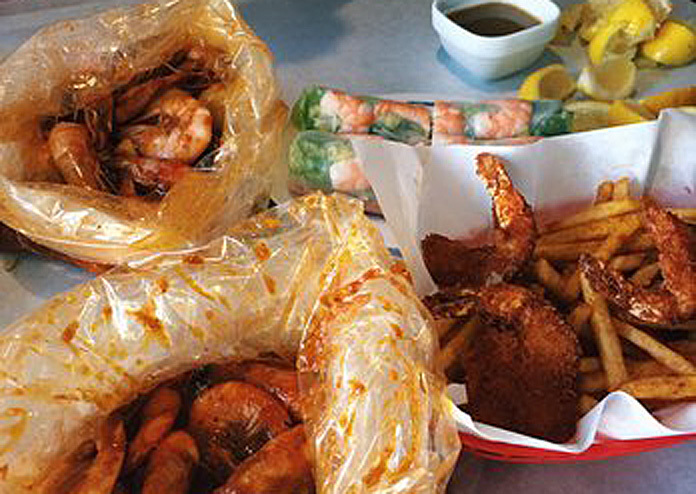 Now you can get Vietnamese food and Cajun shrimp in one spot! I haven’t eaten there since their expansion and fusionification, but it was pretty good before. I’m eager to discover what new delights they offer. Phoenix is a chain of yummy Chinese restaurants in this area. I like the entrees a lot (Honey Walnut Shrimp – mmmmm!) but it’s also kind of cool that they have Phoenix Desserts specializing in just desserts, and just up San Gabriel Blvd a ways. 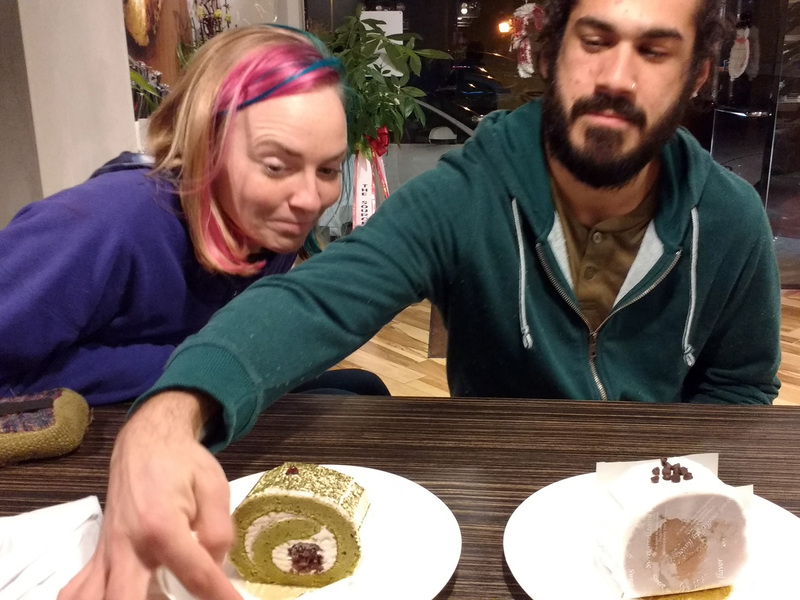 I like all the colorful “art desserts”! And I dare you to try to get out of there without having the friendly staff convince you to let them make some tiny “waffles” for you.